I don’t remember when I bought this book, but it was my second Julian, and my first full translation. Now I have a number of different translations, but for many years it was the only one I had. Today it seems a little battered and worn, but considering it has accompanied me for what must be over twenty years it doesn’t look too bad. I don’t know how many times I had read it, but when I was thinking about a text for my Lenten meditation this year it struck me that it would be a good idea to read Julian again, but this time to read her aloud. To lend her my voice during Lent. What a wonderful idea that turned out to be, one I do not take credit for, simply because it seemed so right and worked so well. This Penguin Classics translation by Clifton Walters was published in 1966. Clifton Wolters was Provost of Newcastle Cathedral and translated not only Julian’s Revelations but also The Cloud of Unknowing and The Fire of Love by Richard Rolle. It has since been replaced in the Penguin Classics series by a more recent translation by Elizabeth Spearing, but it is still easy to find a second-hand copy. The first thing I liked about this translation was the introduction. Only thirty-four pages long, it is a wonderful overview of the church and society Julian knew, the little information known about Julian herself, and the main themes of the Revelations. The translation itself is modern, it flows naturally and is easy to read aloud. This book contains only the long version of Julian’s writing, and each chapter is headed with an analysis of the contents, which it is noted at the beginning of the book was compiled by ‘a later scribe’ and was ‘not part of the original book’. I find these headings useful and miss them when they are omitted. The short text does not have them, and other translations sometimes omit them or use other forms. Reading this text aloud I found it spoke to my heart. I could hear Julian’s voice and to my surprise sometimes found her funny and always down-to-earth. The great let-down for me was the translation of Julian’s most famous words: ‘all shall be well, and all shall be well, and all manner of thing shall be well’. In this translation it becomes, ‘it is all going to be all right; it is all going to be all right; everything is going to be all right’. It was rather shocking to realise that ‘all shall be well . . . ‘ was nowhere to be found in this translation, since this is Julian’s best-known quote, but at the same time I felt that this is truly what we would say, and therefore it does fit. You miss out on ‘all shall be well . . . ‘ and if you know Julian from anywhere you are expecting to find it, but wouldn’t we reassure someone with ‘everything is going to be all right’? I understand why the writer of a modern translation would use these words. And yet, and yet . . . I missed the quote. For me, it is the weakness of this translation. Having said that, this is a wonderful translation, and one I know I will read again and again. I am still trying to find the one that best suits my way of reading Julian, and my third Julian is my favourite so far, but Clifton Wolters’ translation is definitely worth reading. 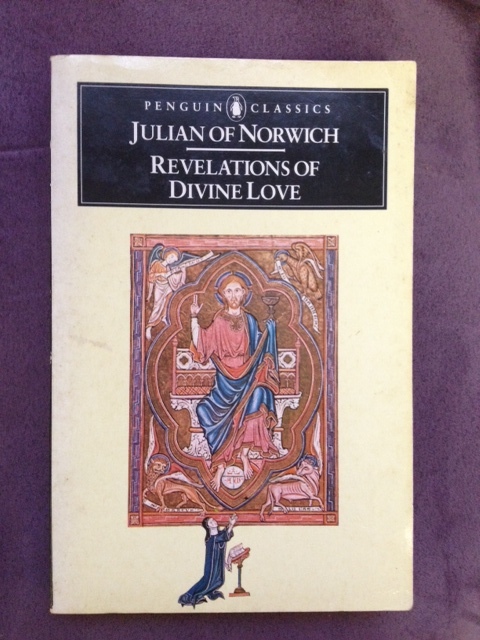 This entry was posted in Editions of Julian's writing, Julian of Norwich and tagged all shall be well, Clifton Wolters, Julian of Norwich, lenten meditation, Penguin Classic, Revelations Of Divine Love by tokyopurplegirl. Bookmark the permalink.